I was fortunate to have Michelle Krause of Leah Michelle Designs agree to an interview with me for the final installment of my designer series. I asked Michelle my Five Questions, and here’s how she answered. I live in Yellowknife, Northwest Territories, which is in northern Canada. I have lived here pretty well all my life so knitwear has always been a staple in my wardrobe. I can’t imagine not living in knitwear! I learned to knit when I was young but didn’t stick with it. I always meant to get back to it but didn’t until I had my own children and decided that I was going to knit hats and mittens for them. I started knitting obsessively and haven’t stopped since. I am still knitting for my kids, who are teenagers now, and for my husband and of course for myself. I am a teacher and school administrator but I’m on my year off right now – so I have even more time for knitting – yay! I often modified the patterns I was knitting and there were certain things I always changed to fit my needs or my style. So I just eventually decided that I should write my own patterns to share those techniques or ideas that I thought were important. I gave it a try and it became very addictive! 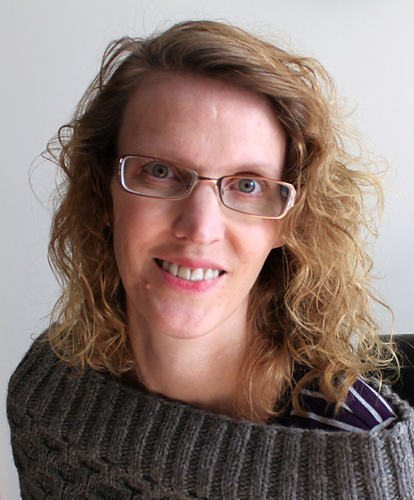 For me it brings together so many things I enjoy – knitting, creating, writing, publishing. It is very rewarding. 3) How would you describe your design style? That’s a hard question to answer. I just design what feels right to me and that is hard to put into words. I guess the words I would use to describe my design style would be: uncomplicated, clean, simple, symmetrical, natural, textural, luxurious. I love to work with luxurious fibres like wool, silk, and cashmere. I design accessories, which are great for gift knitting, probably because most of my own knitting has always been accessories that I give to others. 4) What is your favourite pattern of your own design? That changes all the time. Right now my favourite pattern is my Fashion Forward Cowl. It is big and squishy and warm. I’m really in love with it. My first scarf pattern – Just A Little Twist – will always have a special place in my heart because it was my first paid pattern and it sold really well when I published it. It was such a thrill! My holiday gift knitting is always primarily for my mom and for my sister. They are my biggest fans and I always knit for them at Christmas. So yes, I have ordered the yarn and I will be getting to work on that very, very soon. I can’t give away all the details here (they could be listening), but I might be knitting a Fashion Forward Hat or two this season! I’d like to thank Michelle so much for her great answers. It’s been a real pleasure browsing through her designs for this interview, they really are gorgeous. Michelle has been so generous to keep the tradition of providing a free pattern to one commenter on the interview. So, leave a comment below, telling us your favourite Leah Michelle Designs pattern, before midnight MST on Tuesday, December 1st and I will do a draw the next day to choose a winner. Good luck! Time for another independent designer interview and giveaway. Today’s featured designer is Tori Gurbisz of Lachesis and Co. I asked Tori my Five Questions, and here’s how she answered. I live in Savannah, GA…which is definitely not the knitwear capital of the world! Knitwear design is my full time gig, over the past few months I left all of the little part time jobs I was doing so I could focus more on designing and growing my business. I took up knitting 7 years ago, mainly as something to do with my hands when I quit smoking, I also took up marathon running at the same time. When I first started knitting, I only made lots of squares and rectangles out of big box store acrylic yarn. In 2009 I discovered Ravelry and it really opened up my eyes and gave me the courage to move beyond scarves and Red Heart Super Saver. The Malabrigo Junkies Ravelry group has “Malabrigo March” every year and as part of that there is a design contest. For some crazy reason, at the time I had only been seriously knitting for about a year, I decided that I would enter. So I sketched and swatched and came up with my Belmondo Shawl. I didn’t win the contest, but once that one design was out there I couldn’t stop. It amazed me, because I didn’t think I would have many more good ideas after that one. Little did I know that it would get to the point where I now have more sketches in notebooks, on the back of napkins and on post-it notes than I could ever have the time to make! This is a stumper! I don’t know how I would describe my style. Basically it is me…the things I design are the things that I either like to knit or that I like to wear. I never took the time to decide on an aesthetic, I always go with what is inspiring me the most at the moment and screaming “knit me!” the loudest. This changes a lot! Belmondo gets worn the most and last winter you could not get me to take off Adrastea. I usually don’t do much gift knitting, I am a big Christmas baker. All of my immediate family members, which are strewn across the US, get big boxes of homemade cookies, candies and snacks from me. I occasionally include some small knitted items in the goodie boxes, like anything from Anna Hrachovec or Pint Sized Pines by Julie Tarsha. I have been meaning to make my boyfriend a Star Wars Admiral Ackbar Sock Monkey by Carbonscoring for at least the past 2 Christmases…this year I might actually get to it! Thank you so much Tori for answering all of my questions. You can find Tori’s Gift-A-Long bundle here, where you will find all of the patterns that she has on sale for 25% off until Friday, November 21st at midnight EST. Tori has been gracious enough to offer up a free pattern or e-book to one lucky winner. Leave a comment below, telling us your favourite Lachesis and Co. design, before midnight MST on Saturday, November 22nd and I will do a draw the next day to choose a winner. Good luck! Today’s featured independent designer is Janelle Martin of Eclectic Closet. I’ve been a knitter for more than 30 years and I love it more each year. I’ve been teaching and designing a number of years and this past August I taught outside of Ontario for the first time, at Lancaster Yarn Shop in Lancaster County, PA and at Cast On! Cast Off! in St. John’s, NL. I was awarded the 2011-2012 Sally Melville Award (KW Knitters’ Guild), awarded (by members’ votes) to “the knitter who has most inspired its members.” What makes it such a special award is that Sally was such an inspiration to me when I was a young knitter. She was one of the cofounders of our local knitter’s guild, a guild filled with a number of innovative knitting designers such as Sally and Debbie New. This past spring I was honoured to receive the Amy Hallman Snyder Textile, Fibre and Quilting Arts Award at the 26th Annual Arts Awards Waterloo Region. I started designing just to see if I could do it. A number of people had suggested that I should design but I had never really thought of myself as creative. I took painting and drawing courses in high school and university but felt I didn’t have a message or esthetic I wanted to share in those mediums. I was always drawn to collage work and I think, for me, designing knits is closest to this process. I start with my “blank canvas” by choosing the shape of the piece I want and then I combine stitch patterns to create the texture upon that canvas. The exciting part for me is creating organic designs. I like there to be continuous lines in my work, for the stitch patterns to grow out of each other. Often this means I have to create transition charts to move from one stitch pattern into the other. My complex lace designs, such as Cartouche Shawl or Flower Bell Stole, often have five or six charts to handle these transitions, but the result is worth it. I’m most drawn to lace and cables, but especially Japanese stitch patterns for lace. I own a large collection of stitch dictionaries and spend a lot of time contemplating ways to combine different stitch patterns. I then work up stitch charts to combine the various elements and then swatch to see how they work on the needles. Each new design that I release becomes a favourite at the time, but I do have a few personal favourites. I keep coming back to the stitch patterns most recently used in the Cartouche Stole and I have two other designs in the works that utilize elements from the stole. Obviously I’m not done with these stitch patterns yet! For personal wear at the moment I’d have to pick the Fossetta Cowl (how can you beat the cuddly warmth of Yak?) and New Tech Cowl. This year I’m limiting myself to small gifts, leggings for my niece and a hat for my nephew. The past few years I’ve knit a lot of Christmas gifts so I decided to give myself a break this year. Too many years where I was still finishing knitting gifts early on Christmas morning! All photographs used by permission, copyright Janelle Martin. Top photo taken by Janelle’s dad, all others by Shawn Miller. Thank you so much to Janelle for sharing your story with us! To celebrate the Gift-A-Long, Janelle and I would like to offer you the opportunity to win one of her patterns. To enter, have a look through Janelle’s patterns and leave a comment below telling us which is your favourite. Leave your comment before midnight MST Thursday, November 20th and I will do a draw the next day to choose a winner. Good luck everyone! I asked Anjali my Five Questions, and here is how she answered. I work full time as a programmer and knit and design in my free time. I live with my husband and my 6-year old son in Bangalore, India. I like to travel, read and take long walks on the beach (sad there is no beach in Bangalore). I have not yet made up my mind on what I love more: tea or coffee. I am a novice photographer and a budding baker. 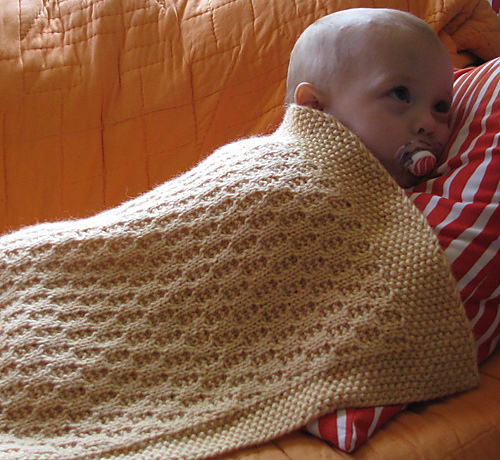 It all started with a simple wish to make a blanket for my baby when I was pregnant. After searching high and low for a pattern, I couldn’t find any that I liked. I decided to make one up myself (I didn’t know the term designing then). I hunted down a nice stitch pattern in my stitchionary, worked out the gauge and thus was born my first ever pattern, As Sweet As Honey Baby Blanket. I enjoyed the process so much that I continued doing it. I don’t really work towards having a distinct style, but I always keep in mind the practicality of the knitted piece and the interest of the knitter. I try to keep my designs simple, yet add one interesting element to it. To name a few: Hira has beads, Texo Pullover has cabled pocket and Dyvest has interesting cable transitions. It is so hard to choose! For purely sentimental reasons, I would say ‘As Sweet As Honey Baby Blanket’ as it was my first design and also it was made specially for my baby. Oh yes. 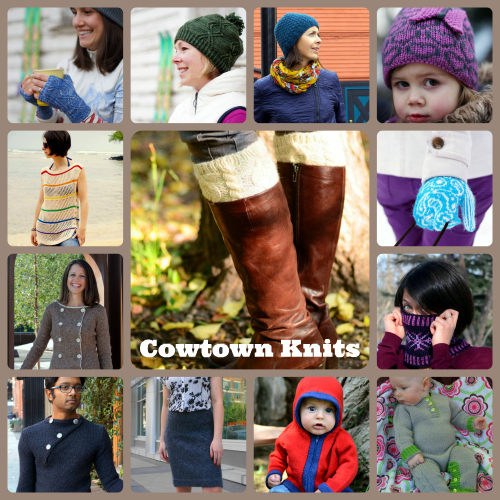 I am so excited to see so many great patterns offered for sale and KAL. I am planning to make a hat for my son. Allotrope Hat looks interesting. I might decide to make a baby cardigan if my mood strikes. Thank you so much Anjali for answering my questions so thoughtfully! It’s a pleasure to have been able to feature you on my blog. 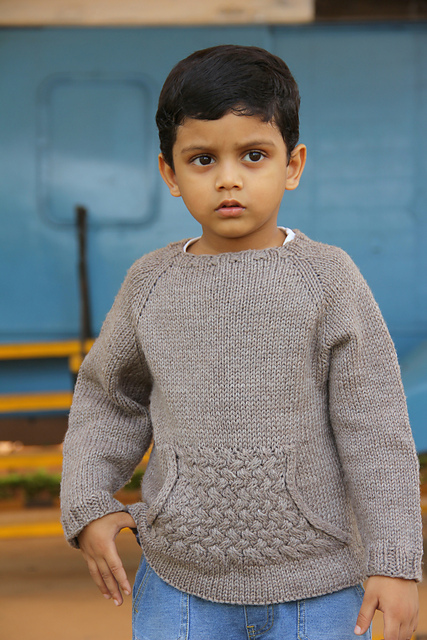 To celebrate the Gift-A-Long, Anjali and I would like to offer you the opportunity to win one of her patterns. To enter, have a look through Anjali’s patterns and leave a comment below telling us which is your favourite. Leave your comment before midnight MST Wednesday, November 19th and I will do a draw the next day to choose a winner. Good luck everyone! It’s Gift-A-Long time again! The fantastic promotion, social event that went so well last year is happening again. 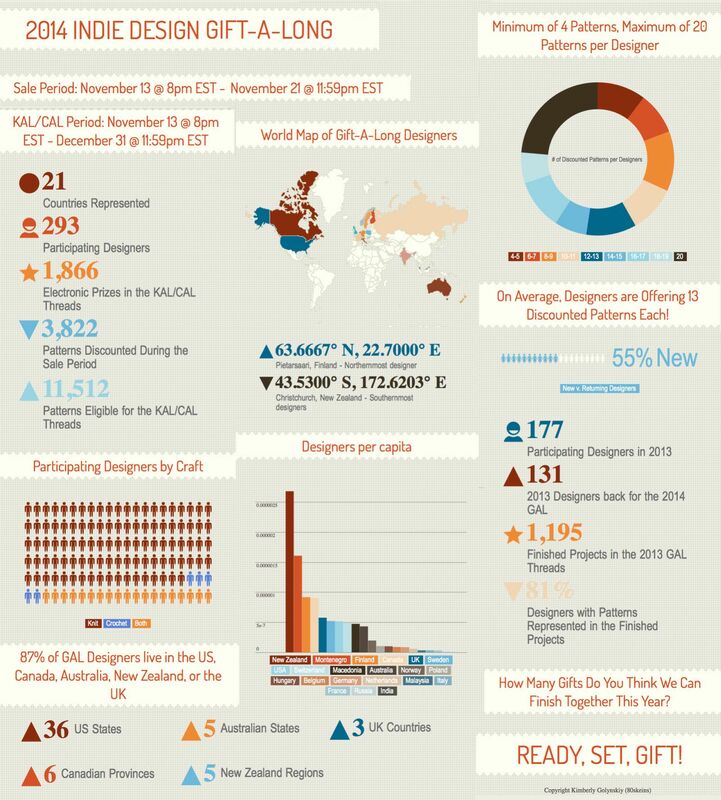 1) 293 independent designers are offering a bunch of their patterns for 25% off from November 13th until November 21st at midnight EST. 2) Thousands of knitters and crocheters are crafting along together, sharing photos of their works-in-progress and finished-objects on Ravelry. This part of the event runs from November 13th until December 31st at midnight EST. 3) There are literally thousands of prizes to be won during the event, including free patterns, yarn, notions and even interchangeable needle sets. If you’d like to browse the patterns that are on sale you can check out the amazing Pinterest boards that a hoard of volunteers have put together. All of my self-published non-free designs are included in the sale. You can see them here in my Gift-A-Long Bundle. One of the most fun parts of the Gift-A-Long for us designers is the chance to hang out together and support each other. Really, that was the purpose of the event from the outset: Indie designers pooling their resources to lift each other up. In that spirit, I’m going to be featuring some of my favourite designers on the blog over the next few weeks. Keep watching for your chance to win some prizes too!